A sweet, savory, sticky appetizer or side dish that everyone from vegans to carnivores will love. Gluten free, too! Cranberry balsamic glazed cauliflower wings are great gluten free appetizers for Thanksgiving or Christmas, or a great gluten free side dish any time. They are also a way to use up leftover cranberries. Everyone from vegans to carnivores will adore this sweet, tangy, sticky Cranberry Balsamic Glazed Cauliflower Wings. Disclosure: There are affiliate links in this post, meaning that if you click and make a purchase, the cost to you is the same, but I will receive a few pennies. I use the money to help maintain this website and to bring you new recipes! In a way, the house kind of felt like a leftover. A leftover from his old, bachelor life. Before we were dating. Even before we met. He decided to buy a house, he set the criteria, he did the searching, he picked it out. I’d say he decorated it, but other than a new bed, some old couches from his grad school apartment, and the lamps and curtains the previous owners had left, “decor” was pretty much nonexistent. Over the course of the few years that we were dating, I helped out with some projects here and there, but as our wedding was approaching, the house still felt like just a house to me. To be perfectly honest, it felt like his house, not even our house. So would it, could it ever feel like home? I was willing to stay for a year or so. It was the practical decision. It made sense financially. Just a year. But you know, sometimes leftovers, when you put a little thought and love into them, add a few new ingredients to bring in some completely different flavors, can become even better than the original meal. So good that you want to savor this new dish and make it last as long as possible. Now, eight years later, a little reluctantly, we are leaving that house. Our house. Our home. We are leaving it so much better than what it used to be. And I don’t just mean the style. Just after our wedding, we tackled the kitchen. As we tore down walls together, we also broke down any little things that we may not have known about each other until we got married and starting living together. And as we rebuilt it, we formed not only the heart and soul of our home, but also the heart and soul of our marriage. The very foundation was laid as we sanded and painted, and even as we blended our distinct styles and tastes to pick out all the details from the wood of the cabinets to our orange walls. Room by room, we’ve gone through that house and it no longer resembles its former self. Whether it was a major renovation, or simply repainting or moving around some furniture, each room became exactly what we needed it to be at a given moment in time. A den to watch football with our friends was eventually filled with toys. A small bedroom that had been empty became an office and eventually a nursery. The large, empty living room, while not used often, was just the place display some mementos of our travels, and to hang our stockings, put up our Christmas tree, and set up folding tables for large holiday dinners. These changes made it a prettier house. The events and thoughts and emotions that were behind these changes made it our home. It’s no longer leftovers. It’s become it’s own special, unique recipe. We started with what was there, added a pinch of paint, a dash of details, and stirred it together with a whole lot of love. Now we are leaving our “leftovers” for someone else. I hope that they recognize what is already there, but mix in whatever is special to them to make it even more amazing. I hope that we can do the same in the house that right now is just our new house, but that I want to soon call “home”. And that last bit of leftover cranberry sauce that nobody wants? I’m thinking it’ll taste even better once you make these Cranberry Balsamic Glazed Cauliflower Wings! Cranberry Balsamic Glazed Cauliflower Wings are sweet and savory, tangy and tender, sticky and oh, so good. I mean, so many people have loved my Balsamic Glazed Cauliflower Wings that I couldn’t help myself, and just had to sneak a little of that cranberry flavor in there. I love how the cranberry flavor complements the balsamic vinegar, and since I use my Cinnamon Orange Cranberry Sauce, that hint of citrus and a nice little zing. As I always say with my “wing” recipes, you might not fool the meat-eaters, but you’ll certainly get them to eat a few more veggies if you serve these. I may loves me some chicken and steak, but I pretty much devoured almost this entire batch of cranberry balsamic glazed cauliflower wings myself, though my boys did help me out. Want to chat with fellow foodies? Join my No-Fuss Food and Fun group on Facebook. Everyday we have fun topics, share recipes and ideas, ask and answer questions, and see all of my new Cupcakes & Kale Chips creations! If you’d like to check it out, you can request to join HERE. Remove from the oven and pour the sauce over the cauliflower. Toss gently. Return to the oven for another 5-10 minutes, flipping again after 5 minutes. Need some more ways to use up leftover cranberry sauce? This was fantastic! Everyone loved it. What a beautiful post! My husband and I will be leaving the apartment we’ve been calling home for the past 8 1/2 years this spring, and we’ve done a ton of work to it. It will be bittersweet. Your words really resonated with me. I love them too! So many ways to change them up! Mmmmm. That cauliflower recipe looks sooo good! 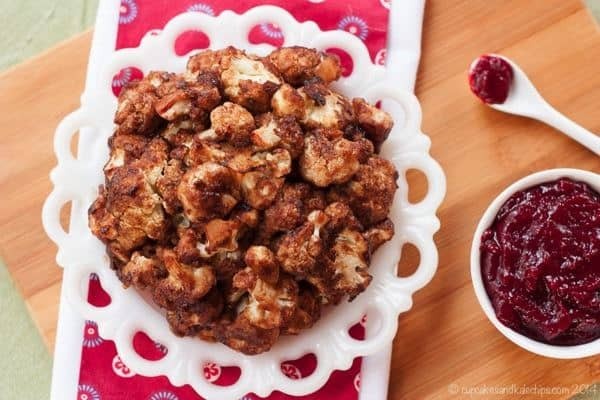 Another great cauliflower recipe, Brianne! Yum! Just bookmarked this–I’m SUCH A fan of cauliflower-turned-wings! The exterior on these look absolutely amazing. Can’t wait to try it! I seriously love this recipe! I cannot wait to make this one! Oh yes my cauli-love sister, you have done it again!! These look and sound fabulous! It’s so hard leaving a place with so many memories. I can relate, we have moved quite a bit and it’s always so hard. Good luck to you in your move and these “wings” sound delicious!! Awww, that was a sweet post :). And can I just say that you are the queen of cauliflower wings? These look amazing. One of these days I’ll get my bootie in gear and try making some (because I want to everytime I see some of yours). Such a sweet post, Brianne. I have similar feelings about my house. I can’t imagine ever leaving it, but I know we will sooner or later. Best wishes to you in your new home! Lovely story Brianne! And now you are off to start a new chapter! 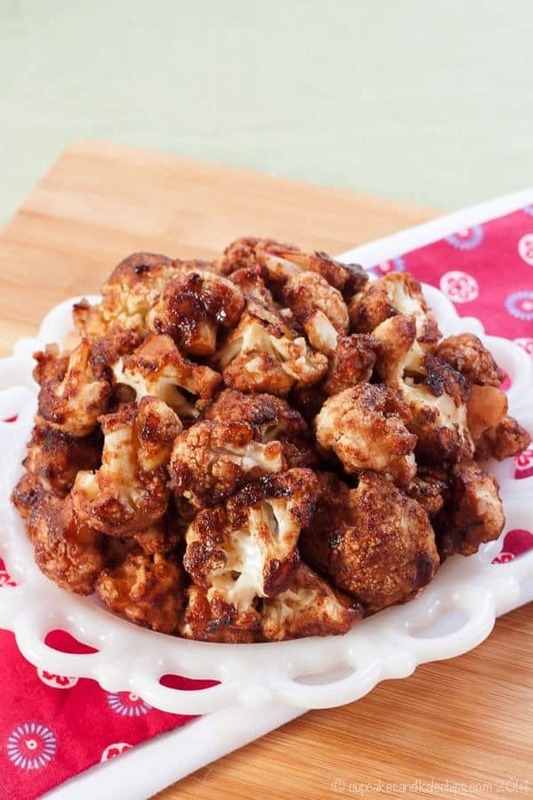 We are big fans of cauliflower here so I need to try this recipe along with all your other cauliflower recipes!! What a great way to change up cauliflower! I wonder if I could get the kiddo’s to eat these up! Hmmmm……. You never know. Kids love sweet and sticky stuff! WOW these look amazing! I have cauliflower in the refrigerator and haven’t decided what to do with it yet…I think I just figured it out! I want to devour the entire plate. Good luck with your new home, I know you will start to feel at home in no time! 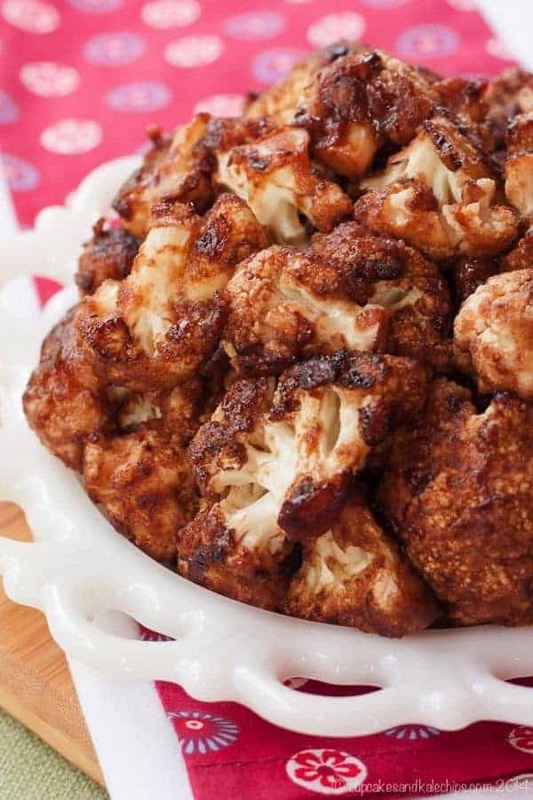 You have done it again and made cauliflower look so divine. I would go for an extra big helping!! Hey, if it gets my boys to eat it happily, I’ll keep going with it! Oh, YEAH! 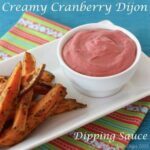 This looks like a marvelous use for cranberry sauce! I love, love cauliflower and your wings look amazing! My wings for dinner and your bars for dessert! Thank Liz! My family would LOVE these! What a great idea! These “wings” look so yummy and absolutely guiltless! Brianne, you are the queen of faux wings! These looks delectable! I love that you fixed up that bachelor house together and made it a family home, while getting to know each other. I wish you blessings in your new home and much joy. May you continue to learn about each other and to grow in love. What a great way to have a veggie focused day after Thanksgiving! Aww…that house was filled with too many good memories and I hope that does the same at your new place, too. 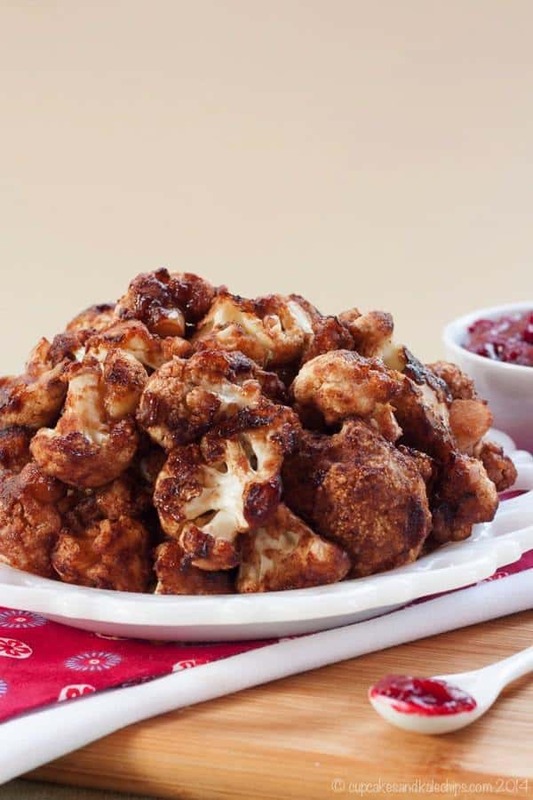 This cranberry balsamic-glazed cauliflower sounds fantastic. I can totally nibble on these all day…. It really was! Yes, these are definitely great for snacking on!